The Delaware Valley's gluten-free bakeries got some great publicity in the Philadelphia Inquirer's Food section yesterday, with a feature on the improving variety of breads and gourmet sweets available in the area. The logical extension to putting your favorite design on a birthday cake is having it on your pizza. As I wrote on Tuesday, Pizza Prints that feature cartoon characters, NBA teams and holiday images are available for gluten-free pies at several local pizza shops. Congrats to reader Kate M., who was the winner of the recent Robert Mondavi Wine Tour giveaway. I'll have another giveaway - a tasty one at that - coming up soon. Naked Pizza in Ewing (1400 Parkway Ave., 609-771-6100) and soon in Princeton (180 Nassau St.) has gluten-free pizza. A video on the chain's website shows the prep methods to avoid cross-contamination. A stone's throw from Rittenhouse Square in Center City is Pure Fare (119 S. 21st St., 267-318-7441). All of Pure Fare's salads are gluten free except wheatberry and falafel, and most soups are safe as well. Also gluten free are the quinoa skillet bread, veggie quiche, quinoa porridge, all pastries and the soft-serve frozen yogurt. Comings and goings: Reader Rich S. let me know that Bonefish Grill is opening soon in Langhorne at the Plaza at Oxford Valley (500 Oxford Valley Rd., 215-702-1312). The debut is set for November 14. Celebrity chef Bobby Flay has opened his newest Bobby's Burger Palace location at the Cherry Hill Mall (2000 Rte. 38, 856-382-7462). Meanwhile, gluten-free-friendly JayBee's Cafe in Skippack has closed, as has L'Oca, an Italian BYOB in Philadelphia's Fairmount section that offered gluten-free pasta. Look for Udi's gluten-free burger buns at participating Red Robin locations. Reader Jodi F. posted on the Gluten Free Philly Facebook page that the Langhorne location has them. Pei Wei Asian Diner is offering a buy-one-get-one entree voucher redeemable through November 15 by watching a video at its new Pei Wei Market website and submitting your email address. Philadelphia's own gluten-free Sweet Freedom Bakery (1424 South St., 215-545-1899) has plenty of items for fall, including pumpkin pies, cookies, cupcakes, donuts and more. The bakery is taking advance orders for the upcoming Thanksgiving holiday by phone. Finally, an ice cream cake without those gluteny chocolate crunchies. 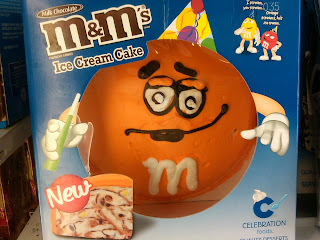 I spotted an M&Ms-themed cake with no gluten ingredients at ShopRite in Marlton. Trader Joe's has added some new gluten-free products since my last visit there. Among the offerings are packages of masala dosa, chicken tikka masala and beef pho soup. The CHOP children's celiac support group will next meet in Princeton on Sunday, November 13 to celebrate Thanksgiving. The meeting will take place at the CHOP Specialty Care Center (707 Alexander Rd., Suite 205) from noon to 2 p.m. Guests can RSVP with their last name and number and ages of children by November 9 by calling 215-590-2985. Bring your favorite gluten-free side dish along with the recipe. I had a behind-the-scenes look at Naked Pizza here in NYC last week. They definitely have an educated staff. The gluten-free pizza is good too! The M&M cake is interesting. For years we have ordered birthday cakes from Dairy Queen asking them to substitute the chocolate cookie crunchies with crushed M&Ms. They always do it with no problem, but it's nice to have something readily available in the supermarket.